The upper limb has sacrificed locomotor function and stability for mobility, dexterity and precision. The hand sits at the end of the upper limb and is a combination of complex joints whose function is to manipulate, grip and grasp- this is made possible by the opposing movement of the thumb. The distal region the phalanges (fingers). The carpus consists of eight bones, sitting in two rows, with four bones in each row (figure 1). The carpus controls length-tension relationships in the multiarticular hand muscles and to allow fine adjustment of grip. Three of the bones in the proximal row articulate with the radius forming the radiocarpal joint and distally with the distal carpal forming the midcarpal joint. The four carpal bones in the distal row articulate with the bases of the five metacarpal bones forming the carpometacarpal joints. The joints formed between the carpal bones are known as the intercarpal joints and most are of the plane synovial type, as the bones interlock with each other the rows are sometimes referred to as two single synovial joints. The arrangement of the bones and ligaments allows very little movement between bones, but they do slide contributing to the finer movements of the wrist. The exception to this is the capitate which has a larger range of movement. The small bones are named after the shape they resemble. Triquetrum – (three cornered) – Nestles in the space between the lunate and hamate. When the hand is adducted it enters the radiocarpal joint. Pisiform – (pea shaped) = a small round bone found in the tendon of flexor carpi ulnaris. It articulates with the palmar surface of the triquetrum. The anterior surface projects distally and laterally forming the medial part of the carpal tunnel. Capitate - head shaped – The largest of all the carpal bones sitting centrally and articulating with the lunate and scaphoid, medially with the hamate and laterally with the trapezoid. The distal surface articulates mainly with the base of the third metacarpal but also by narrow surfaces with the bases of the second and fourth metacarpals. Hamate – hooked – This is wedge shaped with a curved palpable hook projecting from the palmar surface near the base of the fifth metacarpal. The metacarpus, the palm of the hand, which is made up of five bones – the metacarpals. The bones are numbered laterally, from the thumb, 1 – 5. Each bone is long with a proximal quadrilateral base, a shaft (body) and a distal rounded head. The base of the first metacarpal is saddle-shaped and articulates with he trapezium. The base of the second metacarpal articulates with the trapezium, trapezoid and capitate. The base of the third metacarpal articulates with the capitate. The bases of the fourth and fifth metacarpal articulate with the hamate. The bases of the second to fifth metacarpals also articulate with each other. The heads of the metacarpals, commonly known as knuckles, are smooth and rounded and extend onto the palmar surface – these become visible when the fist is clenched. The head of the first metacarpal is wider than the others, having two sesamoid bones, usually found in the short tendons crossing the joint, which articulate with the palmar part of the joint surface. The heads fit into a concavity on the base of the proximal phalanx at the metacarapophlangeal joints. The phalanges, the fingers, consist of 14 long bones. Apart from the thumb (the pollex) each phalanx has three bones, the distal, middle and proximal phalanx – the thumb has only two distal and proximal. As with the metacarpals the phalanges are numbered 1-5 starting at the thumb. The proximal phalanx is large and is concave for articulation with the head of the metacarpal. 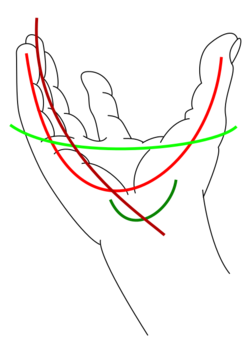 The shaft is curved along its length being convex dorsally. It is convex from side to side on its dorsal surface and flat on the palmar surface. The distal end, the head, is smaller and convex to articulate with the next bone in sequence. In order from the thumb digits are also known as the index finger, middle finger, ring finger and little finger. The wrist has two degrees of freedom, although some say three degrees of freedom because they include the movements of pronation and supination, which occur at the the radioulnar joint. The radioulnar joint is often referred to as a joint of the forearm but it is this articulation that gives the wrist more freedom of movement. The true joints of the wrist and hand are listed in the table below. The stability of the wrist is provided by ligaments (see table); on the palmar aspect is the flexor retinaculum which together with the carpal bones forms a canal – the carpal tunnel - which nerves, muscles and blood vessels run through, it is this area that is involved in carpal tunnel syndrome. The hand, when in at rest, forms a hollow at the palm, with the fingers flexed and the thumb in slight opposition. There are three distinct arches, longitudinal, oblique and transverse, that are formed by the bones, ligaments and tendons these are of vital importance when gripping and manipulating objects. These are known as the carpometacarpophalangeal arches run from the wrist to each digit. The arches are concave with the keystone laying level with the metacarpophalangeal joint; muscular imbalance at this point can decrease the concavity of the arch. The most important of these arches are the ones of the index finger and middles finger which are used when gripping objects, especially the arch formed to the index finger which we use when holding and using objects such as a pen. These arch runs from the base of the hypothenar eminence to the head of the second metacarpal. It lies in parallel the palmar crease 'life line' and is evident when holding tools or a tennis raquet. This arches lays across the palm and is maintained by the retinaculum. It runs from the wrist where its shape is maintained by the retinaculum and therefore more rigid, distally to the metacarpals heads where it is much shallower and more flexible. ↑ 1.0 1.1 1.2 1.3 1.4 1.5 Palastanga N, Soames R. Anatomy and Human Movement: Structure and Function. 6th Ed. London: Churchill Livingstone, 2012. ↑ Maitland, G.D. Maitland's Peripheral Manipulations. 3rd Edition Edinburg: Elsevier Butterworth-Heinemann, 1999. ↑ 3.0 3.1 Physical Examination of the Spine and Extremities. Hoppenfield, S. New York: Appleton-Century-Crofts, 1976. ↑ 5.0 5.1 5.2 5.3 Principles of Anatomy & Physiology. Tortora GJ, Derrickson B. 13th Ed. NJ: John Wiley & Sons, Inc, 2012. ↑ Cael C. Functional Anatomy: Musculoskeletal Anatomy, Kinesiology, an Palpation for Manual Therapists. Lippincott Williams & Wilkins, 2009. ↑ 7.0 7.1 Kapandji I.A. The Physiology of the Joints: Volume 1, The Upper Limb. 5th Ed. London: Churchill Livingstone, 1982.